* NOTE: This website is not supported by mobile phone and other similar mobile device browsers. This is a one-day event that is intended for fruit and vegetable growers and others interested in learning about the Food Safety Modernization Act (FSMA) Produce Safety Rule, Good Agricultural Practices (GAPs), and co-management of natural resources and food safety, and details on how to develop a farm food safety plan. If you are an individual with a disability who is in need of an auxiliary aid or service, please contact Karen Montoya by 10/30/18 at 575-646-2584. New Mexico State University is an equal opportunity/affirmative action employer and educator. 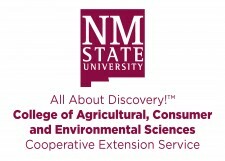 NMSU and the U.S. Department of Agriculture Cooperating. New Mexico State University is an equal opportunity/affirmative action employer and educator. EZregister offers easy and affordable solutions for online event registration and ticketing. Visit our website to learn more about our online event registration and ticketing software.